These Pods are designed for use with Keurig single-serve beverage machines and feature a Starbucks house blend flavor, so you can enjoy a tasty treat. Compatible with Keurig single-serve beverage machines. Start your day without having to leave the house with Starbucks House Blend K-Cups. Made for Keurig, these K-Cups will provide you with the boost of caffeine you need to get going in the morning. The House Blend is a regular medium roast blend that is smooth and full of flavors. You will taste a hint of cocoa and nuts with each sip. The medium roast gives this blend a crisp acidity with just the right amount of sweetness. Have been searching for a consistent blend for my Keurig. Starbucks house blend has been my favorite so far. That is why I have made two bulk purchases from same seller. This makes the coffer just over 50 cents a cup. My last order was June 12 and Iit still hasn’t been delivered. 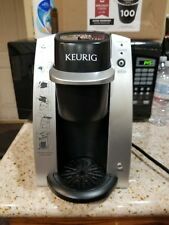 Finally joined the millions enjoying the Keurig coffee maker and the Starbucks House Blend doesn't disappoint. Great buying experience. Happy coffee drinker. Good coffee blend, wife loves it. THANKS.